Understatement and evasion are the key characteristics of Debussy’s setting of Maurice Maeterlinck’s Symbolist play, with each scene centred upon a pregnant, metaphorical incident whose ramifications spread out like the ripples on the water as when, for example, Mélisande carelessly discards away her ring in the well. Michael Boyd’s evocative production for Garsington adheres to these notions of the drama and, if anything, underlines the mystery and inscrutability of the impulses governing the characters’ behaviour. All the symbolic elements are there – the well, the cavern, the pulpit-like balcony from which Mélisande lets down her hair, a sumptuous palace in terminal decline and decay. But Boyd uses the apparently innocent and unknowing figure of Yniold (Golaud’s child from a previous marriage) to heighten the symbolism – having fixed an illumined ball over the scene in Act I, the lad hurled it down towards the dark well at the beginning of Act II just before Pelléas and Mélisande have their fateful tryst at that place. Yniold also later dredges up from the water the long veil and crown which Mélisande had discarded at the beginning of the sad tale. He alone appears to have the nascent ability or courage to access those regions of the soul which the other persons of the drama signally avoid, whether consciously or not. Tom Piper’s designs make a virtue of using the same set throughout the whole opera by manifesting externally the caged-in, entrapped psychologies of those characters who can barely perceive the forces of desire and destiny around them, still less act upon them constructively. This is a world delicately poised on the brink of collapse, with courtiers still in attendance at the court of King Arkel, but the surroundings desolate and shabby. It is a striking moment in the fetid vaults of the castle when Golaud leads Pelléas down a rickety staircase which ends mid-air over a stagnant pool of water, summing up the way in which all the characters of the work so closely hover or circle over disaster and dissolution. The singers are equally attuned to the tempo and mood of this production, tending to move gingerly but tensely over the set, eyeing each other up in suspicion, fear, or incomprehension rather than ever really engaging with each other on normal human terms. Suffering from a throat infection, Paul Gay mimed the part of Golaud whilst Joseph Padfield sang it from the side. Although there was no incongruity between the two aspects of that joint performance, Gay’s presence on the stage did not seem as charged as it might have been had he also been singing. There was no lack of commitment by Padfield, however, who married conviction in the vocal part with a sense of the character’s troubled, prickly personality. Andrea Carroll brought welcome musical clarity and light as Mélisande: her notes were declaimed with precision and confidence, endowing the role with greater resilience than one might ordinarily expect, to the extent even that it is a legitimate question to ask whether the Mélisande of this production is entirely the victim of circumstance insofar as there is perhaps some knowing awareness on her part after all, despite her timidity. 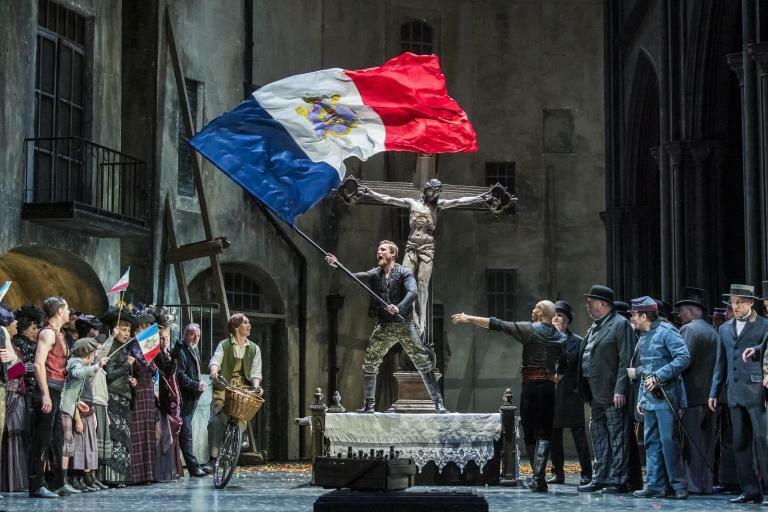 Jonathan McGovern found the humanity in the figure of Pelléas with warmth and radiance in his singing, as far as the direct, recitative-style of Debussy’s writing permitted, though his French accent sat slightly uneasily at times. But he and Carroll worked well as the ill-fated pair in grappling with their feelings for one another, particularly in their sensitive account of the duet in Act IV as they hesitantly recognise the reality of these emotions. Brian Bannatyne-Scott’s Arkel was a consoling presence and voice on stage amidst the prevailing gloom and confusion although he was occasionally overwhelmed by the orchestra. William Davies gave a very accomplished performance, belying his youthful years, as the boy Yniold, carrying himself convincingly both in his singing and acting. Although appearing briefly, Susan Bickley was a subdued, though assured, Geneviève. The production marks the launch of Garsington Opera’s collaboration with the Philharmonia Orchestra in which the ensemble will perform at one production in each of the festival’s forthcoming seasons. This was an auspicious beginning as, under Jac van Steen’s direction, Debussy’s music variously shimmered and shuddered as it unfolded the shifting emotional and psychological states of the characters. Indeed, although the orchestra’s sound was ideally recessed and soft-grained (with particularly subtle integration of the horns and brass) van Steen ensured the score remained alert and responsive – with a beating heart, as it were – and so acted as a vital dimension to the drama in seeming almost to reveal more about it than the characters themselves know. The music swelled and surged where it should, with Golaud’s murderous attack on the lovers rightly registering as the shattering climax (the performance reaching its only fortissimo here), but van Steen secured a seamless drawing away of the orchestral tone from the foreground after such high points, such that each scene was fluidly, organically structured. With the sea and water referenced several times in the work, the same seething and receding textures as are palpable in La Mer (composed shortly after the opera) were evident here. With the satisfying synthesis of its various elements, this production does not so much as answer the questions posed by this provocative drama as put them in a new frame, ensuring that Debussy’s uniquely beautiful opera remains as quietly, insinuatingly compelling as ever it did or should. Devotees of the work will find it stimulating, therefore, whilst newcomers to this most subtle of music dramas (like a sorbet among the heavier, richer fare of so much other operatic repertoire) should be intrigued and engaged in equal measure. Further performances will be given on 22, 25, 27 June, 1, 7 July 2017.